A few of the D'Angelico guitars set to be auctioned, pictured here at the GTR showroom in New York City. Hundreds of acoustic guitars, some dating back to the 19th century, are coming up for auction in New York City. They include Martins, Gibsons, classical guitars from famous Spanish guitar makers, and some exquisite models from Greenwich Village luthier John D'Angelico. To see some of these guitars, I visit the Guitar Center on 14th Street in Manhattan. People trying out guitars — mostly electric — are all around me. Thirty of the items for auction can be previewed here in a special room devoted to acoustic guitars. Arlan Ettinger, the president of Guernsey's auction house, says these 30 represent about 10 percent of the guitars that will be sold at auction. In the collection, there are about 50 Martin guitars, but one made in 1930 is considered the prize. "It's called the OM45 Deluxe," Ettinger says. "The best of the best." Martin only made 11 of them, and this one is going for a reserve of $800,000 — which means that if nobody's willing to pay at least that price, it won't sell at all. The prices have thrown collectors and dealers for a loop. "Starting bid prices are out of sync with the reality of the market," says George Gruhn, owner of Gruhn Guitars in Nashville. He says that some of them are "more than 10 times what I would be asking for a similar instrument." But others say the guitar market is stabilizing after the financial collapse hit collectors hard. Guitar maker Bob Benedetto says most of the guitar collectors he's known over the years were not actually players. "They just loved the instrument and had the disposable income to collect," Benedetto says. When Ettinger held a previous auction of two guitars that belonged to Jerry Garcia of The Grateful Dead, he had a preview called White Collar Deadheads, at which businessmen from Wall Street arrived in impeccable suits. "They would get down on their hands and knees in front of the showcase," Ettinger says, "put their nose against the glass begging us to open the glass, so that just for a brief instant they could put their finger on something played by Jerry. For them, it was absolutely a religious experience." The collector selling the guitars in the current auction is Hank Risan. He heads a company which paid out almost a million dollars to settle a lawsuit with three record labels for selling unauthorized remastered music tracks by The Beatles. That may have something to do with why the collection is being sold. There has been a lot of online chatter about the prices being charged, but for authenticity, Fred Oster of Vintage Instruments in Philadelphia looked over all of the guitars. While a few had been partially refinished, and one Gibson had a new neck, in general, he says, most of the guitars are "quite original — very desirable for what they are." Eleven other guitars and one mandolin in the auction were made by D'Angelico, who had a small workshop in Manhattan starting in the 1930s. His instruments are often called the Stradivari of guitars. Musician David Bromberg told me he once owned one of only two round-holed guitars that D'Angelico ever made. "I had an extraordinary collection of guitars," he said, adding that most of them were sold long ago. "I will never be able to duplicate the collection that I used to own. I will never have enough money to buy back the guitars I sold, or similar guitars." Whether or not any of the instruments being auctioned at Guernsey's will sell at all, given the high reserves, will be determined when the auction begins Wednesday night. Now, acoustic guitars - a lot of them. More than 260 go up for auction tomorrow in New York City. They include Martins, Gibsons, rare classical guitars, and some form a legendary Greenwich Village luthier. Some of them date back to the 19th century. NPR's Margot Adler reports on the collection and whether the guitars will sell. MARGOT ADLER, BYLINE: The Guitar Center on 14th Street in Manhattan is filled with people trying out guitars, mostly electric. But in a special room devoted to acoustics, some of the items up for auction are on display. ARLAN ETTINGER: I'm looking at a wall with about 30 guitars, which is about a tenth of what will be sold. ADLER: That's Arlan Ettinger, president of Guernsey's, the auction house selling the instruments. Among them are about 50 Martin guitars, but one made in 1930 is considered the prize. ETTINGER: And they called it the OM45 Deluxe, the best of the best. ADLER: Martin only made about 11 of them, and this one is going for a reserve of $800,000. That means if nobody is willing to pay that, it won't sell at all. The prices have thrown collectors and dealers for a loop. GEORGE GRUHN: Starting bid prices are out of sync with the reality of the market. GRUHN: More than 10 times what I would be asking for a similar instrument. 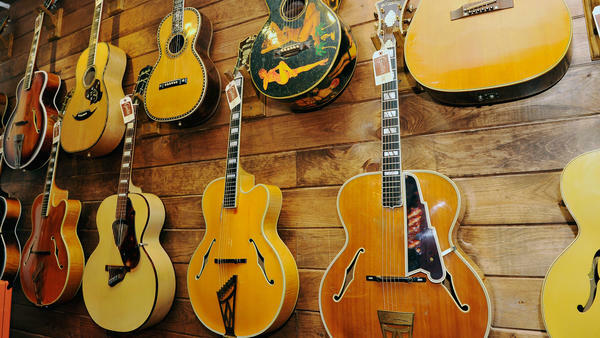 ADLER: But others say the guitar market is showing signs of stabilizing after it crashed during the financial collapse that hit collectors hard. Guitar maker Bob Benedetto says many collectors are not actually players. BOB BENEDETTO: Most of the collectors that I've known over the years just loved the instrument and had the disposable income to collect. ADLER: In fact, Arlan Ettinger told me about a previous Guernsey auction of two guitars that belonged to Jerry Garcia, of The Grateful Dead. He held a preview called White Collar Deadheads, and all these businessmen from Wall Street arrived in their expensive suits and knelt in front of the glass case. ETTINGER: Put their nose against the glass, begging us then to open the glass so that just for a brief instant, they could put their finger on something played by Jerry. For them, it was absolutely a religious experience. FRED OSTER: Most of these guitars being quite original, very desirable for what they are. ADLER: Eleven guitars and one mandolin in the auction were made by John D'Angelico, who had a small workshop in Manhattan starting in the 1930s. His instruments are often called the Stradivari of guitars. Musician David Bromberg told me that he once owned one of the only two round-holed guitars that D'Angelico ever made. DAVID BROMBERG: I had an extraordinary collection of guitars. ADLER: Most of them sadly sold long ago. BROMBERG: I'll never be able to duplicate the collection that I used to own. I just will never have enough money to buy back the guitars I sold or similar guitars. ADLER: Whether or not any of the instruments being auctioned at Guernsey's will sell for anything close to the prices being asked, or even sell at all given the high reserves, will be determined when the auction begins tomorrow night.